This gorgeous salad was part of the New Years dinner I prepared for me and Paul to ring in 2018. 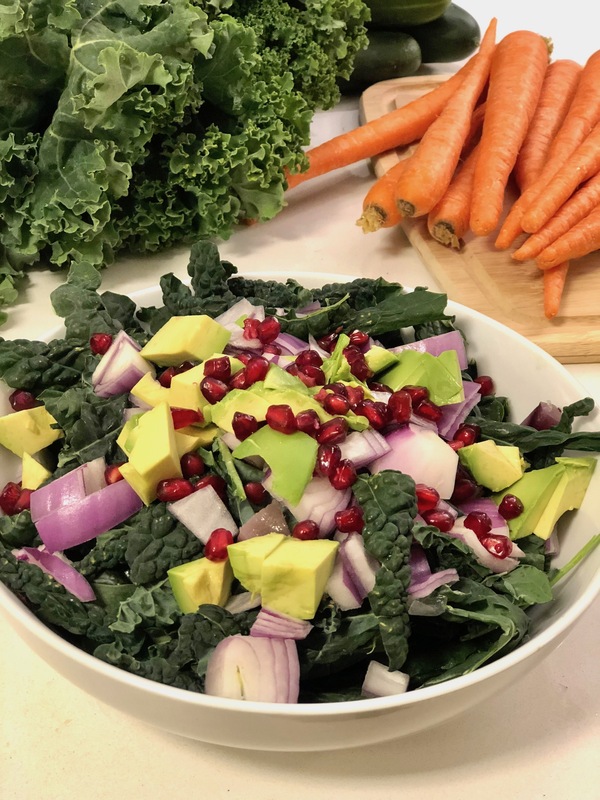 It’s EASY, filling, flavorful and delicious- hence why I’m calling it my favorite kale salad (with some extra goodies). Kale was totally fad-dy last year, but just because it’s 2018 doesn’t mean kale is on the out, and in fact I eat kale at least once daily, EVERY day. 1 cup only has 33 calories (i’m not calorie crazy, but that’s pretty good! )… on average my salads are 2 cups at least of JUST lettuce! I do want you to know though, that I DON’T think kale is the be all end all, we have to vary our veggies to get the MOST benefit- so make sure you don’t eat the same thing all the time! So, try this recipe for lunch or dinner and add your favorite protein like chicken, tofu, salmon or anything else to make it a well balanced MEAL. Enjoy!! Take out a salad bowl (of your choice), and first lay in the kale, then add the veggies. Either use the dressing already made up or in a small bowl mix together the ingredients for the dressing and pour on top. Using spoons, your hands or tongs, mix the dressing into the salad – the more kale is “massaged” the better!